Recent findings have even indicated Neanderthals were cooking, as evidenced by tiny bits of cooked plant material recovered from their teeth. how advanced are we, we know the past going back 400,000 years and we don't know tomorrow. everyone knows tomorrow ... beware! beware! T'is the Ides. When you consider our long history, it's amazing how far we've come in the past couple hundred / couple thousand years. Maybe we were smarter 400,000 years ago and it has been all down hill since then. There have been some recent studies the reckon the brain is getting smaller and that danger also heightens the senses. so as we make society safe and we spend all our time just learning how to communicate with each other we may be losing the ability to innovate. Our intelligence didn't increase linearly over time. It wasn't until society that things began to change rapidly. Poor Neaderthals. Their image is just shot to heck. Not dim witted brutes, but a peaceful society. Given their 'final solution', it appears that they did meet some brutes, namely, us! 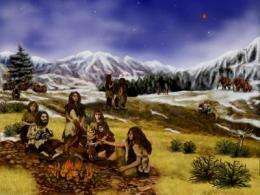 Is it possible that we interbred Neanderthals out of existence or would mass die offs be the only possible cause of their disappearance? It's been shown now that we did interbreed to some extent. Blue eyes and blonde hair come from the Neanderthals, as well as the desire to parade around in skirts/kilts! Those we couldn't 'assimilate', we killed.